Do you own Apple's wildly popular AirPods true wireless Bluetooth buds? 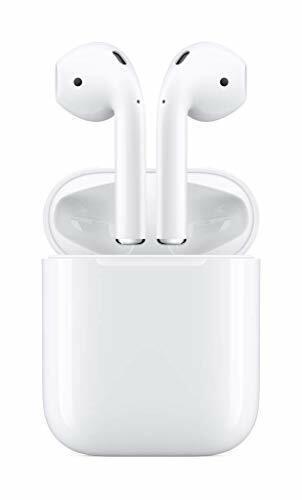 If you do, you are now on the horns of an upgrade dilemma: do you step-up to the company's second generation AirPods 2 ($199)? At first glance, Apple's AirPods augmentations are impressive: voice-activated Siri, Qi wireless charging, longer battery life, clearer calls, and faster iPhone-to-AirPods switching when a call comes in all point to a definitive "Sure!" switch decision. Not so fast, however. Your upgrade decision from the first generation to the second generation AirPods actually hinges on what you're listening to through these devices. AirPod 2 is the newest update from Apple on its wireless earbuds. In terms of physical design and look, they are identical to the first generation AirPods. The hard plastic-tipped Pods themselves, which do not include variable-sized ear tips to customize fit, are still as loose-fitting and difficult to get a noise-isolating seal with, depending on the size of your ear canals, as ever. What is new is that the AirPods 2 has a Qi wireless charging case. With an LED center just beneath the hatch that stays lit for 8 seconds – orange when charging, green when the buds themselves are fully charged – either when sitting on a Qi wireless charging pad or connected to a Lighting cable. Most Qi charging pads include their own LED when something is charging atop if you want to be assured of continued charging. By comparison, the original AirPods case has an LED inside the case that stays lit during Lightning charging. I've gotten into the habit of leaving the top open while charging my AirPods so I know when to disconnect the Lightning cable. The AirPods 2 case retains the rear flushed battery status button, moved up to the center of the case, and the metal hinge is slightly more silvery than the original. How do you set up the AirPods 2? Pairing the AirPods 2 to your iPhone remains as simple as the original. Step 2: Hold the case with the AirPods enclosed within a couple of inches of your iPhone, and tap on the resulting on-screen image. Step 3: Once paired with your iPhone, AirPods also are automatically paired to your Apple Watch for independent listening and chatting, if you have an LTE-enabled Watch. What are the new features with the AirPods 2? The most obvious upgrade for the AirPods 2 is the new Qi wireless charging case. Two things about Qi charging: first, Qi isn't necessarily the boon it appears to be. For one thing, Apple just canceled its announced AirPower multi-device Qi charging pad, which would have enabled you to simultaneously charge your iPhone, Apple Watch and AirPods. While there are multi-Apple device chargers out there (most which charge the iPhone plus the AppleWatch), none supply combined iPhone/Watch/AirPods wireless charging. This means something will need to be plugged in, and you should consider that your iPhone and your Apple Watch are likely higher on your usage priority list. Second, charging AirPods over Qi is a pretty slow process – 3.5 hours from 0-to-100, and that charge time is highly depending on the type of Qi charging mat you have. Via a Lightning jack connection, the new AirPods require just a hair over 2 hours to fully charge, and just 16 minutes to add three hours of music listening and two hours of conversation time. If Qi charging isn't important to you, you can buy the AirPods 2 with a traditional Lightning-only charge case for $159. So, the question is: Are the AirPods 2 improvements enough to upgrade from the first generation? So how to these upgrades play out in actual real-world performance, and do they singly or collectively justify a replacement purchase? Voice-activating Siri is flat-out cool, and she responded instantaneously, regardless of the immediate noise level. Rowdier environments, however, required raising my voice a bit to make myself heard or understood — and collected not a small share of head-turns and quizzical stares from fellow pedestrians. When I put my callers through comparisons between the first generation AirPods and the AirPods 2, they acknowledged hearing me slightly more clearly while conversing through the new ones in more boisterous conditions. For instance, my wife reported some issues when I was using the original AirPods when an overhead train rumbled noisily around 300 feet from me. Identical circumstances while on the AirPods 2? No problem hearing me above the noise. I couldn't put them through sufficient windy conditions for me to conduct a comparison during my test time, but wind is often more an issue at the wearer's end since it's difficult to create a complete noise-isolating fit with either generation of AirPods – you'll almost always experience ambient noise seepage. Apple's claim of speedier transfer of calls from iPhone to AirPods – taking the call on the phone then removing the AirPods from their case and sticking them in your ears – may be technically correct. But, after taking calls on my iPhone then switching first to the original then the AirPods 2, I couldn't detect a faster connection. AirPods 2's gaming latency reduction, however, represents a significant improvement over the original. While playing Tap Sports Baseball '19, for instance, the crack of the bat (when I managed to make contact) sounded nearly precisely when I actually made contact, while the impact sound was noticeably delayed with the original AirPods. Cost: The new Apple AirPods 2 are priced at $199 with the wireless charging case. You can buy a wireless case for just $79, and the AirPods without the wireless charging case is $149. Your decision to upgrade from the first generation to the new AirPods 2 depends on how you most use them. Upgrading to AirPods 2 is recommended if you use them more to talk – or in equal measure to – listening to music. AirPods 2's extra hour of talk, where you get two additional hours of talk time from just 16 minutes of charging, plus the enhanced ambient and wind noise reduction, all make a huge difference in the quality and quantity of your voice communications. How heavy a gamer you are also might contribute to how much the latency improvements will justify an upgrade. Obviously if you're a chatty gamer, ponying up for the Gen 2 AirPods becomes a no-brainer. However, if you're mostly a music listener and only a casual player, it's hard to rationalize spending $200 on the new Pods. Uttering Siri's name rather than tapping twice is both kind of cool and convenient for when your hands are otherwise occupied, and maybe Qi charging affords some additional powering convenience. But without music listening improvements, with recharging and music listening times remaining the same, and a lack of fit upgrades, theAirPods 2 remain as slippery and insecure as the originals. Other than just possibly splurging on the new Qi case to get wireless charging convenience for your current first generation AirPods, I just can't recommend an upgrade to AirPods 2 for anyone but constant conversationalists. Finally, if you're not an AirPods or iPhone owners, here are some true wireless alternatives.